Ticks are tiny, biting arachnids that feed on the blood of warm-blooded animals, including humans. They burrow painlessly into the skin with their feeding parts, bite, draw blood and eventually drop off when they become engorged with blood. Only the feeding parts are inserted into the skin. The body, which is dark in color and ranges from the size of a poppy seed to a pencil eraser, remains visible on the skin surface or scalp. Ticks swell and turn bluish-gray when filled with blood. 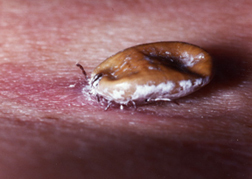 Most tick bites in the United States involve hard ticks (Ixodidae), which have been increasing in number since the middle 1900s. Secretions from the tick's feeding parts can cause skin reactions, such as raised areas, lumps and growths called granulomas. Fever and paralysis also may develop after tick bites, although paralysis is rare. In addition, ticks can be infected with bacteria, viruses or protozoa. These organisms can be transmitted from the tick to the host (the animal or person) as the tick feeds, causing disease.